Themes: war, peace, lifetimes, resilience, hope, survival, literature, libraries, story. With a writer of the calibre of Margaret Wild it was never in doubt that the text would be superb. Add to this Freya Blackwood’s artwork and you have a book that is destined to be a multiple award winning classic. This is a story of the trauma of war and the fragility of life. But it is much more: a reminder that there are things that cannot be destroyed with bombs. Literature, the power of words and stories, strength of human spirit and hope are the true treasures which continue to survive and sustain people through times of great tragedy and devastation. Margaret Wild has long been known and awarded for her writing, and in this book we see her at her best. In just a few hundred carefully chosen words Wild gifts the reader a powerful tale that is sobering and uplifting, challenging and inspiring. The quality of the text is equally matched by the illustrations by Freya Blackwood which beautifully complement the story. I may or may not have a teeny tiny obsession with the artwork of Freya Blackwood as noted here, here and here (Must work on being less obvious about my adoration of certain illustrators). ‘The Treasure Box’ is instantly recognisable as the work of Freya (Oh! I used her first name, maybe I can pretend we’re friends?) but she has also employed some amazing paper cutting and diorama techniques, which she talks about in more detail here on her blog. 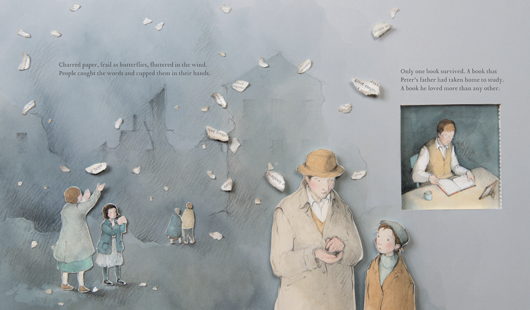 Included in the collage of the illustrations are pages of text from foreign language editions of ‘The Silver Donkey’ by Sonya Hartnett, as well as ‘Once’ and ‘Then’ by Morris Gleitzman, much loved books for young people about war, hope and survival. That these powerful books are somehow all woven into one another with such skill and beauty adds much to the overall production masterpiece that is ‘The Treasure Box’. Study other pictures books which deal with war. Some of my favourites include those listed below. We see war depicted on the news and in newspapers. Books such as these listed above give more insight into personal experiences of war. How do books improve our understanding of world events such as wars? Study other works by Margaret Wild and list the themes and topics she covers in her books. Study other books by Freya Blackwood and investigate and describe her illustration techniques. In your own life, what do you consider your most precious treasure? 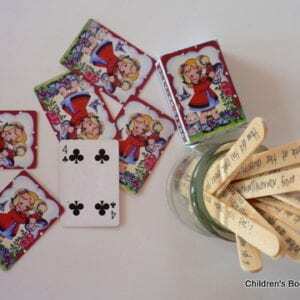 Illustrate this treasure and write a short passage with reasons why your treasure is so valuable to you. 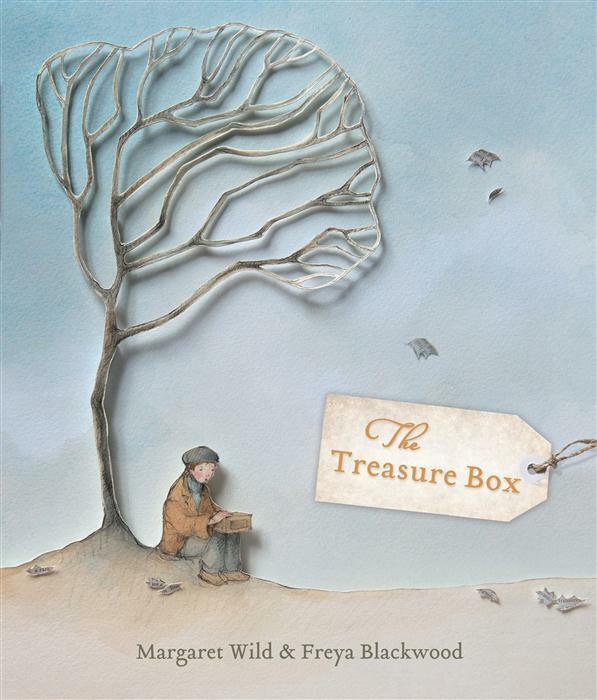 If done as a class activity, students treasures illustrations and text could be put inside ‘treasure boxes’ and displayed as class treasure. Time should be allowed for investigating each other’s treasures and reflecting on what is important to us all. Consider the sentence: ‘When the enemy bombed the library, everything burned.’ Is the writer talking here of just books? What else is lost when a library is destroyed? Think not just of physical items that are lost. Many books for young people that deal with war talk of the burning of books by those in power. Why might people in power want to destroy books? The book that is treasured is not named throughout the story. What might be the reason for this? Look carefully at the colour in the illustrations and how the colours change. How is colour used to convey mood? Included in the collage of the illustrations arepages of text from foreign language editions of several books. Use an online translating tool to translate some of the words and list the languages used. Why might languages from around the world have been used? Have a go at employing some of the techniques used by Freya Blackwood: collage, paper cutting, diorama, pencil, watercolour. Build up layers to create an illustration that tells a story. I simply love the cut paper, diorama-like feel of the illustrations. This illustrator is new to me! I found you via the Hop, and I hope you’ll come by and see my site as well (http://teachwithpicturebooks.blogspot.com) and consider following. Will indeed follow you! Freya Blackwood is one of Australia’s BEST illustrators! Those illustrations are BEAUTIFUL – love them! The story sounds wonderful too and the themes, while certainly sombre are so meaningful. Great pick! Thanks for linking into the Kid Lit Blog Hop! WOW! I want to read it NOW, based on this review. It looks stunning and with a wonderful message. Thank you for posting it. 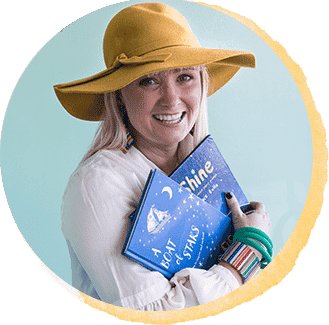 I am stopping by on the Kid Lit Blog Hop and am now one of your followers.